July 30, 2008 In News What is Michelle doing now? 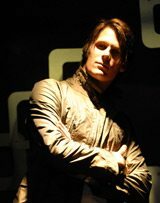 Michelle Chaplow carried out a stills shoot of the new Basshunter Video for The Ministry of Sound. The Oceano Beach hotel in Mijas Costa was an ideal photographic location under a perfect blue sky and the Sono nightclub in Fuengirola provided an excellent backdrop for an evening photo session. The video is for Jonas Erik Altberg, better known as Basshunter, a highly successful Swedish Muscian and DJ. His new single is called, “All I ever wanted” has just been released, his last video ” Now You’re Gone” has had an estimated 30 million internet downloads. Aylar Lie starred in Basshunters’s last video ” Now You’re Gone ” as well as this new sequel video, shot in Spain. Aylar was born in Iran in 1984 and moved to Norway at the age of three. She is one of the most popular figures in Norwegian media. Aylar commented to Michelle that she isn’t really accustomed to being photographed by a female photopgrapher and she felt “very comfortable and relaxed”. The Sono nightclub made a perfect location for the shoot with its colorful geometric lighting panels on the main walls behind the DJ and under the floor. The 35 strong crew directed by Alex Herron, included a full production team, camera, secondary camera, stills, lighting, electricians, stylists, make up, models, actors, extras and many more. The Ministry of Sound have just requested to use a still image from the shoot on Basshunter’s new CD cover. Bikini shot of Aylar Lie.